The International Art, Book and Film Festival takes place in Perpignan from 28 June to 1 July. A jury made up of Fabrice Hergott (Director of the Museum of Modern Art of Paris), Guillaume Houze (Collector), Pierre Thoretton (Film director) and Xavier Cannone (Director Photography museum in Charleroi Belgium) choose the best books and films about art published in the year. During the year, hundreds of books and movies have been consulted by the festival team and the committee, amongst the international art and film production, in both French and English. The Festival’s team is happy to announce the exclusive showing of the new edition of the film Pink Floyd, Live at Pompei. This show will take place on the Cinéma Le Castillet of Perpignan on Sunday 1st July at 18h in the presence of the film’s director, Adrian Maben. 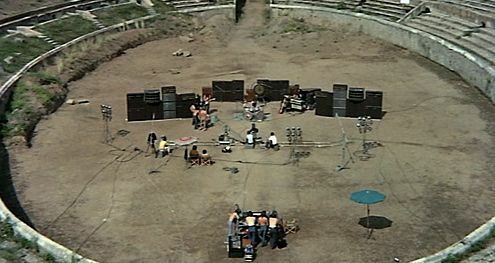 In October 1971, Pink Floyd gave a spectacular concert to an audience of ghosts in the ruins of Pompeii. Alone in the stone amphitheatre, apart from the production crew, they hammered out their surrealistic, music, a style which lends itself to visual interpretation like no other band in rock-and-roll history. In this strange and exciting film, they perform live amidst the ruins of Old Pompeii, with special effects and dramatic footage blending into a unique audiovisual experience. Including interviews conducted during the making of their album Darkside Of The Moon, with footage taken from the actual recording sessions. An absolute must-see for Pink Floyd fans, songs in this film include: “Echoes – Pts. I and II,” “Careful with that Axe, Eugene,” “A Saucerful of Secrets,” “Set the Controls for the Heart of the Sun,” and more.